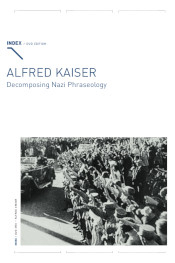 "In the second half of the 1970s Alfred Kaiser was entirely unknown to the film world when he went public with two films, namely A Third Reich (1975) and A Third Reich from Its Refuse (1977). Both compilation films bridge the threshold between avant-garde and documentary cinema and were enthusiastically received by audiences and film critics alike upon their release. (...) Kaiser took footage solely from the era of Nazi film production to make both films which each have a running time of just under 30 minutes. He constellated an evocative montage of image and sound from an abundance of excerpts gleaned from cultural, industrial and feature films as well as propagandistic Nazi newsreels and amateur movies from the 1930s and 1940s. A Third Reich and A Third Reich from Its Refuse are multifaceted compositions that derive from an analytical collision of image and sound metaphors. In brief, their conceptual critique equally serves as an attempt to illustrate and demolish the world of Nazi thought and imagery."